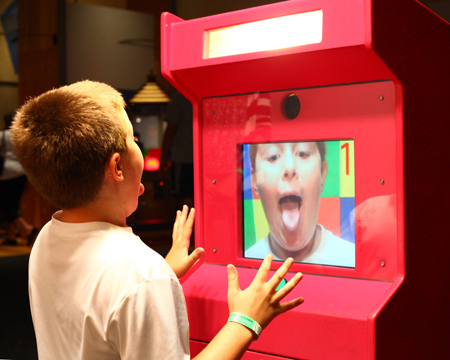 Silly Faces is an interactive video installation in which the viewers create their own 5 second movie. The video uploads immediately to a grid on the wall, an animated mosaic of faces. Everyone is a star. The video mural shows the 65 most recent videos, moving portraits of the audience looping back and forth. Silly Faces was commissioned for the show Yinz Play by the Children’s Museum of Pittsburgh. The interaction of pressing a button on an arcade to record the video makes a fun, social and potentially intimate relationship between the audience playing and the video technology. When a new video is recorded it “bumps” the previous video to the left. The movies are saved into a database in the computer. Custom software enables a collaboration between myself and the audience, creating an evolving animated mural, blurring the line between artist, performer, and spectator. Silly Faces will act as a visualization of the temporary community that comes together at SIGGRAPH. The mural is composed from the audience’s faces and bodies, creating a family or class portrait of the visitors. The playfulness of making a silly face is a unifying gesture that people of all ages and cultures can enjoy.